Situated in Centro, this hotel is just a 10 minute walk to Granada Cathedral, the Plaza Bib-Rambla and the Madrasah of Granada. Amenities at the Hotel Almona include luggage storage, a tour desk and babysitting / child services. A Wi-Fi connection is provided within the hotel, meaning you'll have no issues keeping connected during your stay. 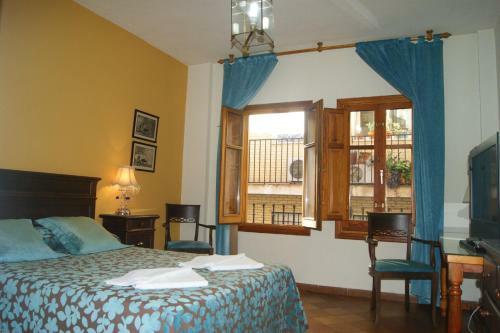 The air-conditioned rooms at the Hotel Almona are comfortable and modern. A TV and a private bathroom can be found in each room of the hotel. Situated close to a range of popular hot spots, the hotel is near lots of bars, nightclubs and quality restaurants. Royal Chapel of Granada is within a short 10 minute walk of the hotel. This hotel is 1871 metres from the Alhambra entrance, 775 metres from Plaza Nueva (the absolute centre of Granada), 970 metres from the train station and 2602 metres from the bus station.